With the explosion of rapidly advancing technology, a rising new generation is becoming more tech savvy and heavily relies on products that embody the meaning of convenience. AXIS is disruptive, innovative, and perfectly exemplifies that. AXIS is introducing you to the world of DIY 2.0, where technology meets the do-it-yourself (DIY) space. AXIS Gear is a smart device that motorizes new and existing window shades for the home. AXIS, RIC Centre client, presents a unique solution that is suitable with any type of new or existing window shade for any homeowner or tenant. Their Indiegogo campaign raised over $122,000 USD for AXIS Gear; a whopping 118% of the company’s target! Through the campaign, the company also formed relationships from key players in their target industries including energy, home security, and retail. “To most people, the campaign was successful because we hit our goal. But for us, success was the ability to identify who our target audience was. We used Indiegogo as more of an experiment to determine who our customers really are,” explains Trung Pham, CEO and founder of AXIS. channels on the commercial end. “The RIC Centre provides us access to various connections and advisors. 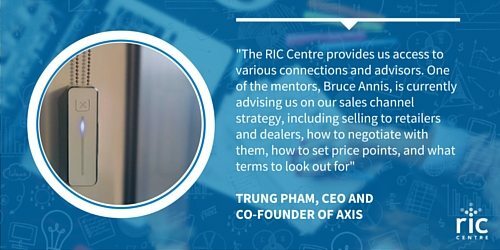 One of the mentors, Bruce Annis, is currently advising us on our sales channel strategy, including selling to retailers and dealers, how to negotiate with them, how to set price points, and what terms to look out for,” Trung Pham, CEO and founder of AXIS. “I would recommend that, 2-4 months before the campaign, you should be developing an email list of potential customers. Create landing pages, buy ads, create content marketing pieces that will drive people to the landing pages. When you actually launch the campaign, contact everyone on that email list to get initial traction on the campaign. You need 30% of your backers within the first few days in order to be featured on the website,” explains Trung Pham, CEO and founder of AXIS.